Regally bred filly Miss Fabulass has followed in her mother's footsteps, winning the Group Two Tea Rose Stakes at Randwick. John Singleton-owned Miss Fabulass has shown her multi-million-dollar pedigree to claim a maiden win in Group company at Randwick. 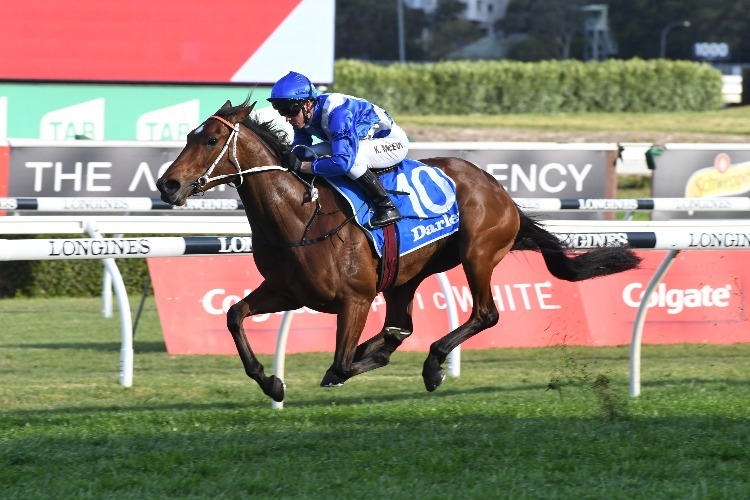 Sent out at $10 after a disappointing sixth a fortnight ago, the well-bred filly bounced back to shoot through a gap at the 0 mark and claim victory in the Group Two Tea Rose Stakes (1400m) by 1-1/2 lengths from Fiesta ($4.80 fav) . Trainer Kris Lees said it was always the plan for jockey Kerrin Mcevoy to race up on the pace after being ridden quieter last start. "He had plenty of horse underneath him," Lees said. "They weren't going that quick but he just looked for a bit of room and she really let fly." "We know she can do that once or twice a week at home." The three-year-old is the fourth foal out of Samantha Miss who Lees trained to win the four legs of the Princess series which culminates in the Group One Flight Stakes in two weeks. She went on to run third in the Cox Plate as a three-year-old before winning the VRC Oaks. After she retired, Singleton paid $3.85 million for Samantha Miss. He sent her to England to be served by unbeaten champion Frankel to southern hemisphere time with Miss Fabulass the result. "She has the brilliance of her mum," Lees said. "She just hasn't got the race sense, but it's coming." Her jockey Kerrin McEvoy is confident the filly will run the 1 m of the Flight. "She's obviously untried at the mile, but if we can just get her to switch off she is going to run it out really strong and be really hard to beat in that race," he said. "The best is yet to come still. She's an exciting filly to be a part of for sure."